Never made these before but you make them sound easy enough (and delicious)! Will give them a go. Looks great Steph! We also ate ours with cinnamon-sugar and my husband was in heaven. He grew up on potato pancakes (latkes) and always ate those with cinnamon-sugar as well – so this took him back to childhood! They look fabulous! I haven’t had time to do this one, but I will definitely try it when I do. Mine are sitting in the freezer, but I am looking forward to seeing everyone’s filling ideas for when I bring them out! Never heard of these! I will have to try them. I bet it’s good wrapped around smoked salmon and fresh cheese. Wonderful! 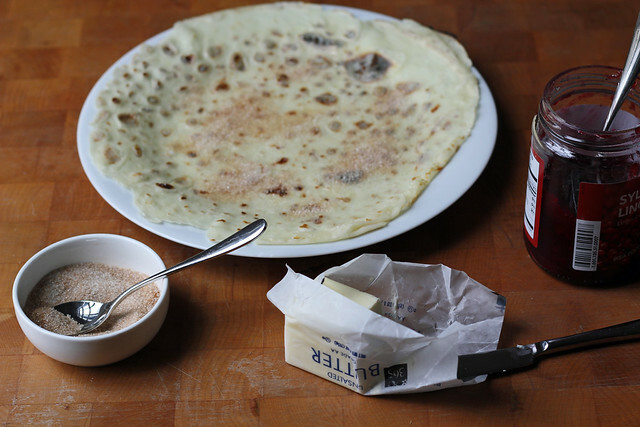 I have a great story about lefse (and my Norwegian mom and grandma) in my post. 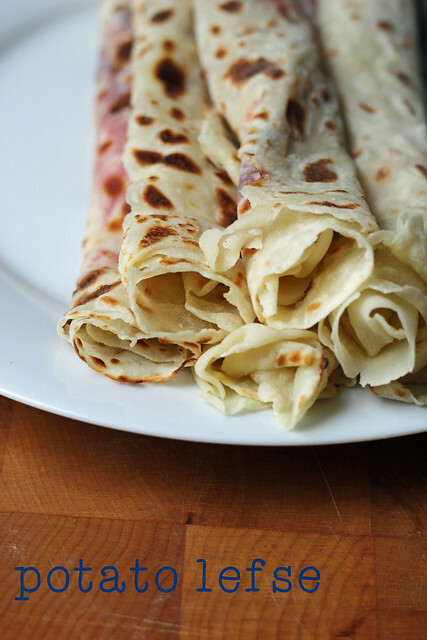 Lefse has a special place in my heart…..and tummy?1? LOL! I hadn’t heard of lefses before this. They were easy to make and delicious. Your pic of them looks great. Don’t tell anyone, but I actually did try the hot dog thing tonight. Not bad! You photos are beautiful. They look lovely and you did a great job with the shaping. Yours look perfect! You got them nice and thin. I just cannot wrap (no pun intended) my head around the hotdog idea.. I guess its not much different from a pig in a blanket, hey? Awesome looking lefses! I wasn’t quite organised enough to make it with the group, but would like to try this anyway! I’m hoping to make these up at the end of the month. Yours came out beautifully! I’m glad to know they worked with improvised tools. I certainly don’t have any of the special ones. The cinnamon sugar looks so good sprinkled on the speckles. So nice and thin, your lefse look quite delicate! I am crazy about all things pancake and crepes. I have never heard of lefse and will certainly have to give these a try! Looks delicious! Do you have any hearty fillings you might recommend or would it be best to stick with more sweet fillings? These would be great with savory fillings…in Norway it’s also traditional to have them wrapped around hot dogs. Lots of others who made them used them as sandwich wraps. I also think anything you like in savory crepes would work well.